Considering an ATM? Consider this first: ATM Management provides a full service ATM program. There is no out of pocket expense, no phone bills, no tying up your money, no charge for labor, no charge for services or for parts. You have an opportunity to become a host location and earn commissions on every transaction. The next time a customer asks “Do you have an ATM?” you’ll know it’s the right time to get an Automated Teller Machine with ATM Management! 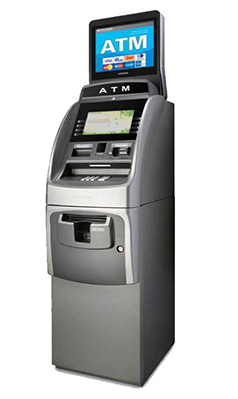 ATM Management recommends a standard fee of $2.50 per transaction. All monies, repairs, monitoring, discrepancies are the sole responsibly of ATM Management. ATM Management will fund all ATMs with the currency as needed. ATM Management will provide and pay for cellular connection; however, a high speed line is preferred if available. Availability to access processors website to view all terminal transactions. Become a host location and have a chance to receive commission on every transaction. 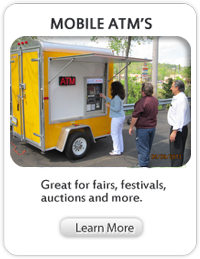 A variety of signs are available to advertise the ATM machine: neon, stand alone, and front door as well as many others! Technical service is available from 9 A.M. - 9 P.M. seven days a week. All calls received after 9 P.M. will be handled the following day. Service contact number for ATM Management is posted on each machine to ensure quality service. Each machine’s transactions are monitored daily from our office. If a machine does not make a transaction within a 24 hour period, a phone call will be made to that location to ensure that the ATM is working properly. ATM Management, and their processor PAI, stand strongly behind their commitment to service. In the event any discrepancies may occur the customer should contact PAI directly. The telephone number for PAI is located on each machine. Any inconsistencies will be handled directly by PAI and not the proprietor of the establishment. When PAI is contacted, they immediately debit ATM Management’s account until the discrepancy has been resolved. Acts of vandalism done to ATM signs, ATM machines or stolen money are the sole responsibility of ATM Management. All other damage incurred is the responsibility of the establishment proprietor. ATM Management carries a two million dollar insurance policy ($2,000,000.00). Certificates of insurance will be provided upon request. Alongside ATM Management’s full service ATM program you will spend NO money for a machine, pay NO money for telephone bills, supply NO money for the ATM, and pay NO service or parts fees. Instead, you will profit! Please feel free to contact us with any questions. I am looking forward to talking with you to finalize an agreement between our companies.